Joseph Altham was born in Haslingden in 1879. He was the son of John and Ellen Altham of 13, Stonefold, Haslingden. 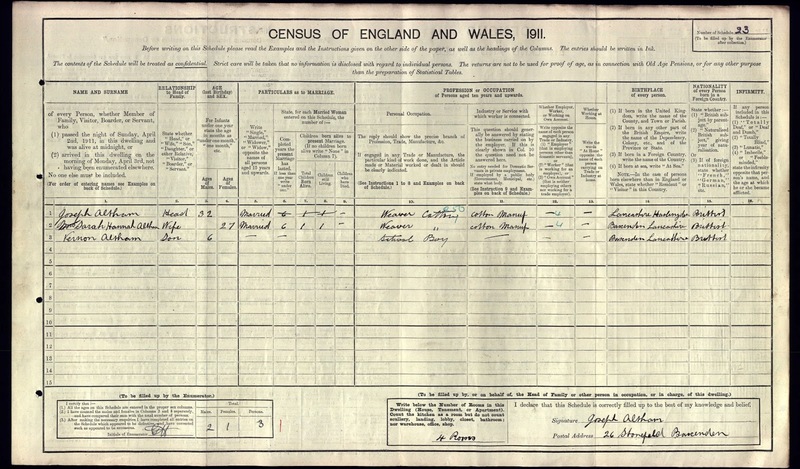 In 1901 Joseph was living at 11, Stonefold with his widowed mother, brother Wilfred and sisters Martha, May and Ellen. He was 21 years old and was employed as a cotton weaver. 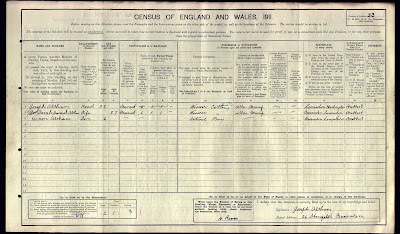 On 4 March 1905 he married Sarah Hannah Grime at St. Stephen’s Church, Grane. They had one son, Vernon, born in 1905. Joseph was a member of Stonefold Church and at the time of his death, his son, Vernon, was a member of the choir there. Prior to joining the army he worked as a cotton weaver at Nicholas Worsley’s Mill, Rising Bridge. He joined up on September 2nd 1916, and went to the front on December 28th of that year. In May 1917 his wife was officially informed that he had been killed, by a bursting shell, whilst leaving the trenches on April 11th 1917. He was 38 years old and his name was listed on the Stonefold Church Roll of Honour. A memorial service was held for him at Stonefold Parish Church. At the time of his death his wife and son lived at 232, Avenue Parade, Accrington. As Joseph Altham’s body was never recovered, his name is recorded on the Arras Memorial. "Private Altham was killed in action at Boiry Becquerelle, France on 11 April 1917. On the evening of 9 April 1917 the Battalion moved up from billets in Adinfer to Boiry Becquevelle where they relieved the 9th King's Own Yorkshire Light Infantry in the front line before the German fortifications of the Hindenburg Line. At 6 am on the 11th, the Battalion, together with the 1st Lincolnshire Regiment, mounted an attack on the German positions. Pte. 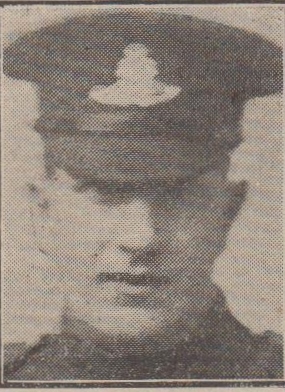 Altham was killed by a shell burst whilst leaving the trenches, but those of his comrades who continued came across German wire of unusual thickness and undamaged by British artillery fire. They were consequently unable to get through the wire and suffered heavy losses. Two officers were killed and three wounded whilst some 120 N.C.O. 's and men were killed or wounded. The following day the Battalion was moved back into reserve".From Bill Turner’s book. In sad but loving remembrance of my dear Husband, Pte. Joseph Altham of the A.P.W.O. Yorkshire Regt., who was killed in action in France on the 11th of April 1917. To that land of eternal rest. The smile hides all the while. We weep but say, "God's will be done." From Mrs. J. Altham and Son 10, Hoyle Street, Rising Bridge, Baxenden. Brother and Sister in law, 16 Delph Street, Haslingden. Only aching hearts can tell." From his Sister in law, Mary Alice, Maggie and Jim (in Salonika). From his sorrowing Brother (now serving) and Sister in law, 16 Delph Street, Haslingden. To bear my heavy cross. A loving husband to the end. One of the best the world contained." From his Wife and Son, 10 Hoyle Street, Rising Bridge, Baxenden. In loving memory of Private J. Altham, killed in France, April 11th 1917. From Mr. and Mrs. Noah Sagar and Family, 181 Hudrake. Thoughts of you are ever near." Mr. and Mrs. Noah Sagar and Family. The face we keep in memory. "Too dearly loved to be forgotten." From Mr and Mrs. Noah Sagar and Family, 181 Hudrake. For oft we shed a silent tear." From Mrs. Altham and Son, 10 Hoyle Street, Rising Bridge. From his Sisters Martha, Ellen and Mary. The Best of brothers this world contained." Sadly missed and deeply mourned by his Brother and Sister in Law, Mr. and Mrs. R. Altham and family, Rising Bridge.